T-cell responses towards tuberculin (purified protein derivative; PPD) or the Mycobacterium tuberculosis-specific antigens early secretory antigenic target (ESAT)-6 and culture filtrate protein-10 are indicative of prior contact with mycobacterial antigens. In this study, we investigated the exceptional case of a 75-yr-old patient who devoted more than one-third of his CD4 T-cells against PPD and ESAT-6. Antigen-specific T-cells were characterised using flow cytometric intracellular cytokine staining, ELISPOT assay, proliferation assays, and T-cell receptor spectratyping. T-cell frequencies were far above those found in age-matched controls (median 0.33%, range 0.05–6.32%) and remained at high levels for >2 yrs. The patient initially presented with haemoptysis, but active tuberculosis was ruled out by repeated analysis of sputum and bronchoalveolar lavage fluid. Skin testing was negative and haemoptyses did not have a M. tuberculosis-related aetiology. Phenotypical and functional properties of specific T-cells were consistent with a terminally differentiated effector-memory phenotype with capacity to produce interferon-γ, interleukin-2 and tumour necrosis factor-α. Epitope mapping showed that the CD4 T-cells were directed against a single peptide from ESAT-6 (amino acid 5–20) that was presented in context of HLA-DR. T-cell receptor Vβ-spectratyping and sequencing of specific CD4 T-cells revealed a prominent peak fraction of monoclonal origin. In conclusion, similar to monoclonal gammopathies of undetermined significance, this may represent the first T-cell counterpart with known specificity against M. tuberculosis. Mycobacterium tuberculosis infection is largely controlled by the cellular arm of adaptive immunity. As this immune response may persist for decades, the presence of a M. tuberculosis-specific T-cell response may be used as an indirect measure for prior contact with the pathogen . Most individuals with either active or latent M. tuberculosis infection show a specific CD4 T-cell response towards purified protein derivative (PPD), and towards the M. tuberculosis-specific antigens early secretory antigenic target (ESAT)-6 and culture filtrate protein (CFP)-10. While PPD is routinely used as a stimulus in the tuberculin skin test in vivo, the antigens ESAT-6 and CFP-10 have been evaluated for ex vivo assessment of mycobacterial immunity as a more specific and potentially more sensitive alternative to skin testing . We have previously shown, using flow cytometry, that M. tuberculosis-specific immunity detected in in vitro assays mainly comprises CD4 T-cells, of which ∼0.25% are directed against PPD [2, 3]. T-cell frequencies towards ESAT-6 and CFP-10 are generally equal or lower in magnitude [2–4] and comprise antigenic specificities that cover several epitopes with varying levels of immunodominance [4, 5]. In this study, we describe an exceptional case of a patient with a surprisingly high frequency of PPD and ESAT-6 reactive CD4 T-cells detected in peripheral blood over a period of >2 yrs. Those T-cells were not only directed against a single ESAT-6 peptide epitope in the context of HLA-DR01, but also were of monoclonal origin. Thus, similar to monoclonal gammopathies of undetermined significance (MGUS), this may represent a T-cell counterpart in which the specificity is directed against M. tuberculosis. This study was conducted with a 75-yr-old male patient who was followed over a time period of >2 yrs. In addition, 70 immunocompetent individuals between the age of 70 and 80 yrs (mean±sd 74.3±3.0 yrs) were recruited that had detectable CD4 T-cell frequencies towards PPD based on routine clinical testing in the setting of contact tracing or in patients with a clinical presentation, where tuberculosis was one differential diagnosis. None of those individuals had active tuberculosis. The study was approved by the local ethics committee and all individuals gave informed consent. Analysis of antigen-specific CD4 T-cells was performed from heparinised whole blood as described previously [6, 7], after stimulation with 222 IU·mL−1 PPD (Tuberkulin-GT-1000; Chiron-Behring, Marburg, Germany), 10 μg·mL−1 recombinant ESAT-6 and CFP-10, respectively (Lionex, Braunschweig, Germany), overlapping pools of 15mer ESAT-6 and CFP-10 peptides (5 μg·mL−1 each; kindly provided by A. Lalvani, London, UK), and three peptide variants (E2a-E2c; custom synthesis GeneCust, Evry, France) (table 1). As negative and positive controls, cells were stimulated with PBS or 2.5 μg·mL−1 Staphylococcus Enterotoxin-B (SEB), respectively. All stimulations were carried out in the presence of 1 μg·mL−1 anti-CD28 and anti-CD49d, respectively. The total stimulation time was 6 h and 10 μg·mL−1 Brefeldin A was added after 2 h to accumulate specifically induced cytokines intracellularly. Cells were fixed using lysing solution (BD, Heidelberg, Germany) and stained using the following fluorescently labelled antibodies: CD4-APC or CD4-PerCP, CD69-PerCP, IFN-γ-FITC, TNF-α-PE, IL-2-PE, CD27-PE, CD45RO-PE, CD62L-PE, CCR7-PE and CD127 Alexa Fluor-647 (all from BD). Samples were analysed on a FACS Calibur using CellQuest software. In selected experiments, stimulation was carried out in the absence (mock) or presence of 10 μg·mL−1 antibodies towards HLA-DR, HLA-DP, or HLA-DQ that were pre-incubated for 2 h (all from BD). Moreover, ESAT-6 and CFP-10 reactive T-cells were quantified from peripheral blood mononuclear cells (PBMCs) using the commercial T-SPOT.TB assay (Oxford-Immunotec, Abingdon, UK). Skin testing was carried out by the intracutaneous inoculation of 10U of PPD (Tuberkulin-GT-10; Chiron Behring) into the forearm and the induration was determined 72 h thereafter. Antigen-specific proliferation was analysed using 3H-thymidine-assay or carboxyfluorescein diacetate-succinimidyl ester (CFSE) dye dilution. For 3H-thymidine assay, 1×105 PBMCs were stimulated in triplicate in RPMI-5%-FCS as described above. Cells were pulsed with 9.25 kBq per well 3H-thymidine after 2 (SEB) or 4 days (other antigens), and incubated for a further 20 h. Thereafter, counts per minute were determined using a harvesting apparatus (Wallac, Freiburg, Germany). The CFSE assay was performed as described before . Briefly, PBMCs were stained with 5 μM CFSE (Molecular Probes, Göttingen, Germany). Thereafter, 200,000 PBMCs per well were stimulated as described above for a total of 3 (SEB) or 5 days (other antigens and peptides). Flow cytometric analysis of CFSE dilution was performed after co-staining using CD3-APC, CD4-PE and CD8-PerCP. For spectratyping and sequencing, PPD-specific CD4 T-cells were isolated using the interferon (IFN)-γ secretion assay (Miltenyi-Biotec, Bergisch-Gladbach, Germany). Isolated PPD-specific CD4 T-cells and whole PBMCs were subjected to RNA isolation using the RNA isolation kit (Qiagen, Hilden, Germany). TCR-Vβ CDR3 spectratyping was performed as described previously . Sequencing of the selected clonal TCR-Vβ chain was performed using the sequencing primers HUMTCRBV13A 5′-GGTATCGACAAGACCCAGGCA-3′ for the sense strand and HUMTCRBC2 5′-ACACAGCGACCTCGGGTGGG-3′ for the antisense strand. A 75-yr-old male patient presented with haemoptysis that had intermittently occurred before over the past 3 yrs. 5 yrs before, he was diagnosed with ischaemic heart disease and left anterior descending artery infarction. He had left ventricular dysfunction (ejection fraction 36%) with mitral valve insufficiency grade II, pulmonary hypertension (56 mmHg) and atrial fibrillation, and received cumarin therapy (international normalised ratio 1.84). Physical examination, chest radiograph, computed tomography (CT) scan, and bronchoscopy including cytological evaluation of bronchial aspirate, did not reveal any evidence for malignancy, and the patient did not develop cancer over a follow-up time of 6 yrs. Standard diagnostics for evidence of M. tuberculosis infection was carried out. Tuberculin skin testing was negative on two occasions, and radiography and CT scan did not show any pathological lung lesions. Sputum and bronchioalveolar lavage were negative for acid fast bacilli and respective cultures were negative. To further assess evidence for prior sensitisation with M. tuberculosis, whole blood was stimulated in vitro using PPD, ESAT-6 and CFP-10, and specific T-cells were identified based on antigen-induced activation by CD69 upregulation and induction of IFN-γ. PBS and SEB were used as negative and positive controls, respectively. As shown in figure 1a, a total of 30.91% of CD4 T-cells was reactive towards PPD. This frequency exceeded levels found in age-matched control persons by far, which had median levels of 0.33% only (range 0.05–6.32%; fig. 1b). Interestingly, a similarly high percentage of CD4 T-cells responded to ESAT-6 (30.41%) and a lower, but clearly detectable, fraction showed reactivity towards CFP-10 (1.34%). As estimated with differential blood counts, this corresponded to 87.3, 85.9 and 3.6 CD4 T-cells per μL whole blood that were specific for PPD, ESAT-6 and CFP-10, respectively. In line with results from flow cytometry, the spots in a commercial ELISPOT assay were confluent after stimulation with ESAT-6, whereas lower numbers were detected after stimulation with CFP-10 and phytohaemagglutinin (13 and 104 spot-forming cells per 250,000 PBMCs, respectively; fig. 1c). Likewise, a strong proliferative response towards PPD and ESAT-6 was observed using either a 3H-thymidine assay (fig. 1d) or a CFSE-based approach (fig. 1e). Taken together, despite lack of skin test reactivity, an extremely high frequency of CD4 T-cells was directed against PPD and ESAT-6. Although specific T-cell frequencies slightly decreased over time, this immune response remained at high levels over an observation period of >2 yrs (fig. 2). High frequencies of purified protein derivative (PPD) and early secretory antigenic target (ESAT)-6 reactive CD4 T-cells. a) Whole blood was stimulated with PPD, ESAT-6, culture filtrate protein (CFP)-10 and Staphylococcus aureus enterotoxin B (SEB), and analysed using flow cytometry. Numbers refer to the percentage of antigen-specific CD4 T-cells that were quantified based on activation (CD69) and interferon (IFN)-γ induction. b) PPD reactive CD4 T-cell frequencies in an age-matched control cohort. The bar represents median frequencies. c) Peripheral blood mononuclear cells (PBMCs) were stimulated with ESAT-6, CFP-10 and phytohaemagglutinin (PHA) and analysed using ELISPOT assay. Numbers refer to spot-forming cells per 250,000 PBMCs. Analysis of proliferative responses was performed using 3H-thymidine assay (d) and carboxyfluorescein diacetate-succinimidyl ester (CFSE) dilution assay (e). cpm: counts per minute. High levels of purified protein derivative (PPD) and early secretory antigenic target (ESAT)-6 reactive CD4 T-cells over time. 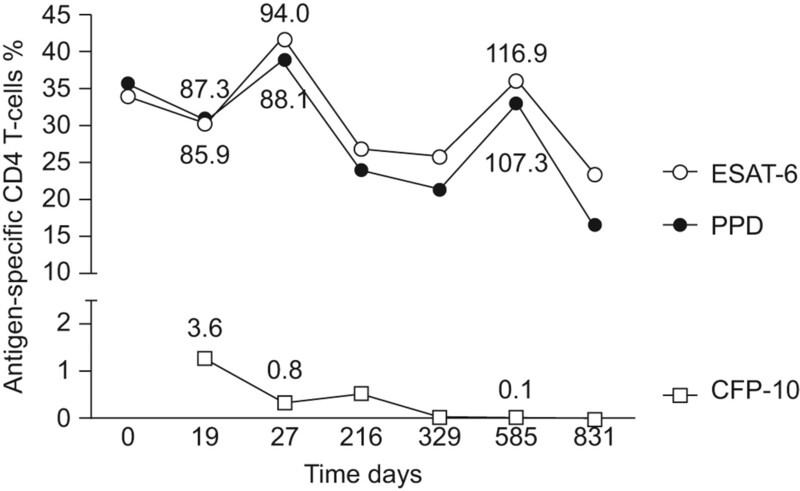 Antigen-specific CD4 T-cells were analysed over a total observation period of 831 days. Shown are the percentages of reactive CD4 T-cells as determined using flow cytometry. Numbers depicted in the graph refer to the absolute numbers of antigen-specific CD4 T-cells per μL whole blood that were calculated when differential blood counts were available (day 19, 27 and 585). Despite mild lymphopenia, these numbers are far higher than those estimated for controls: given 550–1,200 CD4 T-cells per μL as reference values, 0.33% PPD reactive CD4 T-cells (fig. 1b) would correspond to approximately 1.8–4.0 specific CD4 T-cells per μL. CFP: culture filtrate protein. To characterise the phenotype and the function of PPD and ESAT-6 reactive CD4 T-cells in more detail, specific cells were analysed for expression of cell surface markers and cytokines. As shown in figure 3a and b, PPD and ESAT-6 reactive CD4 T-cells were largely positive for CD45RO and CD127, and negative for CD27, CCR7, CD62L and CD38 (not shown). This indicates that PPD and ESAT-6 reactive CD4 T-cells are terminally differentiated effector memory T-cells that have lost the ability to circulate into lymphatic tissue. Cytokine profiling revealed strong expression of tumour necrosis factor (TNF)-α, and the majority of IFN-γ producing cells was co-expressing interleukin (IL)-2 (fig. 3), whereas IL-4, IL-5 and IL-17 were not detectable (data not shown). Together with the lack of the inhibitory cell surface receptors PD-1 and CTLA-4 (data not shown), this indicates functional integrity of specific T-cells. In general, the similarity in frequency as well as phenotypical and functional properties of PPD and ESAT-6 reactive cell that clearly differed from respective characteristics observed in SEB reactive CD4 T-cells (fig. 3c) may indicate that identical cells may be induced by the two stimuli. In support of this, the combined stimulation of blood cells with both PPD and ESAT-6 was not additive in its effect as it elicited a similar percentage of specific cells (24.6%) as individual stimulations with either PPD or ESAT-6 alone (24.1% and 27.2%, respectively). Purified protein derivative (PPD) and early secretory antigenic target (ESAT)-6 reactive CD4 T-cells are similar in phenotype and functionality. Whole blood cells were stimulated with a) PPD, b) ESAT-6 and c) Staphylococcus aureus enterotoxin B (SEB), and antigen reactive CD4 T-cells were assessed for production of cytokines interferon (IFN)-γ, interleukin (IL)-2 and tumour necrosis factor (TNF)-α, as well as cell surface markers such as CD45RO, CD27, CCR7, CD62L, and CD127. No specific expression of IL-4, IL-5, IL-10 or IL-17 was observed and cells were negative for PD-1 and CTLA-4 (data not shown). To further dissect the reactivity profile of ESAT-6 reactive CD4 T-cells, epitope mapping was carried out using a set of 17 overlapping 15mer-peptides spanning the entire ESAT-6 sequence and antigen-reactive CD4 T-cells were analysed for expression of IFN-γ and IL-2 (fig. 4). As expected, stimulation with the entire peptide pool induced a similar frequency of reactive CD4 T-cells as compared to the PPD or ESAT-6 protein (fig. 4b). Interestingly, stimulation with individual peptides E1–E17 revealed that T-cell reactivity was restricted to peptide E2 (fig. 4b). Due to partial sequence overlap (fig. 4a), a minor percentage of T-cells was reactive towards peptide E1, whereas no reactivity was observed after stimulation with peptides E3–E17 (fig. 4b, and data not shown). Likewise, proliferative responses towards peptide E2 were within the same range as PPD and ESAT-6 specific responses (data not shown). Together this indicates that the specificity of T-cells reacting towards PPD and the ESAT-6 protein was almost exclusively restricted to peptide E2. To further identify the minimal epitope responsible for stimulation, E2 peptide variants (E2a–c) were generated and compared with T-cell frequencies elicited by the full-length peptide E2. As shown in table 1, T-cell frequencies after stimulation with peptide E2a were slightly lower (19.5%) but in a similar range as the full length peptide (24.3%). Frequencies were even lower after stimulation with peptide E2b (10.6%), and no response was elicited by peptide E3c. This indicates that the minimal epitope comprises the 10 N-terminal amino-acids of peptide E2, even though this is also included in peptide E1 with minimal T-cell reactivity (table 1). The strong CD4 T-cell response is directed against one individual peptide epitope. a) 17 overlapping 15mer peptides covering the early secretory antigenic target (ESAT)-6 sequence were used (the amino acid sequence of the four N-terminal peptides is depicted). b) Whole blood cells were stimulated with purified protein derivative (PPD), ESAT-6, and the ESAT-6 peptide pool E1–E17, as well as all individual peptides. Peptide E1 elicited a minor reactivity, whereas response towards peptide E2 was comparable to PPD, ESAT-6 or the peptide pool. All other peptides did not elicit any response (E5–E17 not shown). Dot plots show the interferon (IFN)-γ/interleukin (IL)-2 expression pattern of specific CD4 T-cells. To further characterise the major histocompatibility complex (MHC) class-II molecule capable of presenting peptide E2, blood was pre-incubated for 2 h with and without blocking antibodies against HLA-DR, -DP and -DQ, before stimulation with peptide E2. 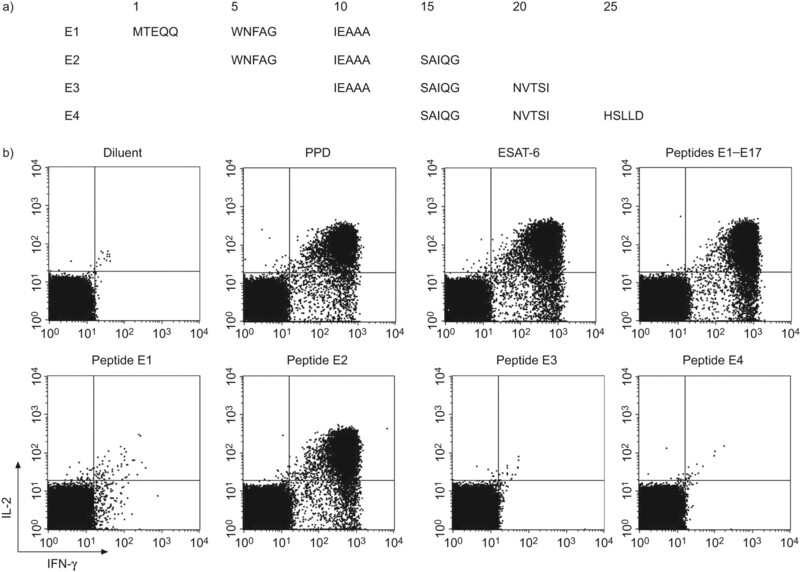 Dot plots showing the IFN-γ and IL-2 expression pattern of E2 reactive CD4 T-cells are shown in figure 5a. Blockade of HLA-DR led to a decrease in both the percentage (fig. 5b) and cytokine production levels (fig. 5c) of E2 reactive CD4 T-cells, and this decrease in reactivity affected both IFN-γ and IL-2. In contrast, the stimulatory capacity remained largely unaffected by pre-incubation with antibodies towards HLA-DP or HLA-DQ. When peptide E2 was entered into the SYFPEITHI database , HLA-DRB1*0101 yielded the highest affinity score among all human HLA class II molecules (score 19). In line with this result, the patient is positive for HLA-DRB1*01. Peptide E2 is presented in the context of human leukocyte antigen (HLA)-DR. Whole blood was pre-incubated for 2 h without (mock) or with 10 μg·mL−1 blocking antibodies towards HLA-DR, HLA-DP and HLA-DQ, and stimulated with peptide E2. 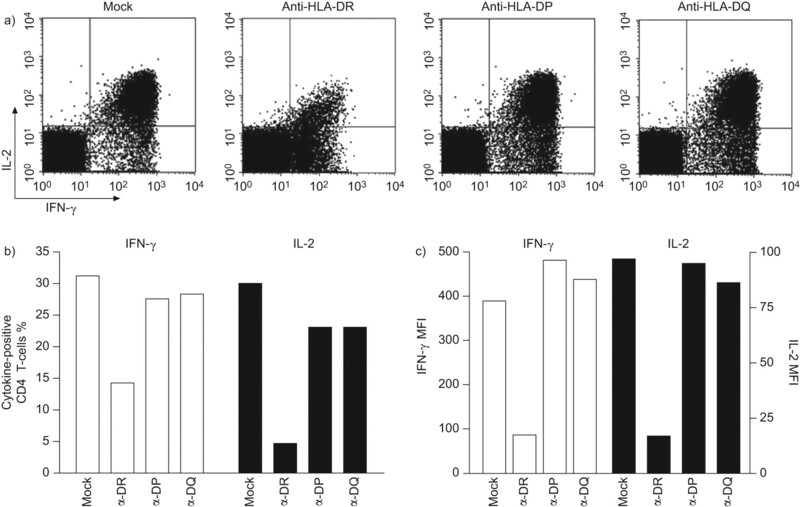 a) Dot plots showing the interferon (IFN)-γ/interleukin (IL)-2 expression. The percentage of IFN-γ and IL-2 positive CD4 T-cells (b) and the mean fluorescence intensity (MFI) for IFN-γ and IL-2 expression (c) was determined. The epitope restriction of antigen-specific CD4 T-cells to a single peptide E2 may indicate clonal origin. To assess potential clonality, the spectrum of CDR3 lengths of the TCR genes among PPD reactive CD4 T-cells was analysed using spectratyping. PPD reactive CD4 T-cells were isolated using a MACS IFN-γ secretion assay as outlined in figure 6a. The purity of IFN-γ positive cells among lymphocytes was 96.3%. Untouched PBMCs from the same patient and PBMCs from an unrelated age-matched control person were collected in parallel. The comparative analysis revealed that TCR spectra in PPD reactive CD4 T-cells clearly differed from those of the whole PBMC preparation or of the control person, and typical patterns are shown in figure 6b. TCR-Vβ2 or -Vβ21 from unfractionated PBMCs showed a distribution comparable to the control patient, whereas weaker signals and a skewed pattern was observed in PPD-specific CD4 T-cells (figure 6b, pattern A). Some TCR, such as TCR-Vβ4 or -Vβ12, showed a normal distribution among unfractionated PBMCs of the patient and those of the control person, whereas no signal was observed among PPD reactive CD4 T-cells (fig. 6b, pattern B). Finally, TCR-Vβ13a among unfractionated PBMCs from the patient presented as a single peak superimposed on a normal spectrum, whereas a single peak with the strongest signal was observed for PPD reactive CD4 T-cells (fig. 6b, right panel). Interestingly, all PCR fragments derived from this peak were identical in sequence. The sequence, shown in figure 7, was identified as TRBV6-2*01, which corresponds to TCR-Vβ13 according to the IMGT database . Taken together, the prominent peak obtained in the TCR-Vβ13 spectrum is derived from T-cells of monoclonal origin specific for peptide E2 from the ESAT-6 protein. Monoclonal expansion of Vβ13 positive cells among purified protein derivative (PPD) reactive CD4 T-cells. a) PPD-reactive CD4 T-cells were sorted using cytokine secretion assay and were compared with unfractionated peripheral blood mononuclear cells (PBMCs) from the patient or a control person. b) Typical T-cell receptor (TCR)-Vβ spectra. In-frame DNA sequence and analysis of the junction of the Mycobacterium tuberculosis reactive T-cell receptor (TCR) V-region. To our knowledge, this is the first report of a patient with an extremely high frequency of antigen-specific CD4 T-cells restricted to a single 15mer-peptide derived from the M. tuberculosis ESAT-6 protein that were considerably stable over a period of >2 yrs. These cells display phenotypical properties of terminally differentiated effector memory T-cells with a T-helper type 1 cytokine expression pattern. These T-cells were of monoclonal origin, as TCR spectratyping from PPD reactive T-cells revealed a prominent peak for which all PCR fragments were identical in sequence. As the patient presented with haemoptyses at the time of analysis, this massive expansion of M. tuberculosis-specific T-cells was initially assumed to be related to active tuberculosis. This may seem plausible, as PPD and ESAT-6 reactive T-cells are usually higher in patients with active tuberculosis as compared to latently infected individuals [2, 12, 13]. However, there was no microbiological evidence for active disease and the cytokine profile of antigen-specific T-cells was consistent with latent infection or an unrecognised history of controlled disease [2, 14]. In the absence of any further evidence of M. tuberculosis-related aetiology or malignancy, the recurrent episodes of haemoptyses most likely resulted from a combination of secondary pulmonary hypertension due to chronic heart failure and oral anticoagulation. The discrepancy between a complete absence of PPD-reactive T-cell reactivity in vivo, illustrated by negative skin test results on two occasions, and the strong PPD-specific response in vitro is striking. This may partially be explained by an increased sensitivity of in vitro assays compared with skin testing . Conversely, skin test anergy in the presence of detectable RD-1-specific [15, 16] or PPD-specific T-cells in vitro may exist  and has been attributed to a lower grade of M. tuberculosis exposure  or to a decreased expression of the cutaneous lymphocyte antigen (CLA), which mediates lymphocyte homing to the skin . In our experimental assay, however, we found that even skin test-positive individuals lacked CLA expression on PPD-specific T-cells (data not shown). Thus, it remains unclear whether low CLA expression may have contributed to skin test anergy in our patient. Another relevant factor may be the patient’s age, as a decline in skin test reactivity has been described in the elderly . Interestingly, this age-related anergy is not due to an overall loss of specific T-cells in the circulation or an inadequate migratory capacity of specific T-cells across dermal endothelial monolayers, but rather to a decreased capacity of dermal macrophages to secrete TNF-α that is essential to mediate cellular infiltration by stimulating expression of endothelial adhesion molecules . An alternative explanation for a reduced skin-test reactivity in our patient may relate to the clonality of his specific T-cell response. A study that has elegantly performed clonal analysis of T-cells after PPD skin testing showed that nearly all clones identified in blisters were also found after PPD-specific stimulation of peripheral blood cells. Conversely, however, only 44–85% of clones identified in the blood were found in the skin, indicating clonal differences in migratory capacities . In our case, the T-cell clone reactive towards peptide E2 may be among those unable to enter the skin, which may explain cutaneous anergy in vivo. When assessing the T-cell response patterns towards the 17 peptides of ESAT-6, immunodominant peptides are clustered in the N- and C-terminal regions [4, 5] and peptide E2 was among the four immunodominant peptides . Interestingly, T-cells with restricted antigen specificity may accumulate in the granuloma tissue of latently infected individuals and may comprise up to 27% of all infiltrating lymphocytes . As these clonal expansions were not observed in corresponding blood cells , the blood-derived monoclonal peptide-specific T-cell frequencies in the range described here are by far higher than those usually observed. It is conceivable that the T-cell response towards peptide E2 could be based on cross-reactivity towards an as yet unidentified epitope derived from another pathogen or environmental antigen and may, therefore, be unrelated to prior contact with M. tuberculosis. However, independent evidence for prior sensitisation is given by the concomitant presence of T-cell immunity towards the M. tuberculosis specific protein CFP-10. While there is no published example of cross-reactivity between ESAT-6 and another pathogen, cross-reactivities have been described among epitopes derived from various human pathogens, including Epstein–Barr virus (EBV), influenza or hepatitis C virus [23–26]. Interestingly, a blast search of peptide E2 revealed some sequence similarity to an epitope derived from leucyl-tRNA-synthetase (13/21 amino acids identity). Although this peptide bears two sequence insertions of four and two amino acids, respectively, which would likely disrupt the linear peptide epitope presented in the MHC class II molecule, it is tempting to speculate whether the strong T-cell response observed here may have been induced by or be cross-reactive to a leucyl-tRNA-synthetase-derived peptide. Of note, aberrant expression or function of tRNA-synthetases may be involved in tumorigenesis [27, 28], but the patient did not show any clinical evidence for malignancy over a follow-up of 6 yrs. The continuous presence of antigen-specific T-cell frequencies well above 10% have frequently been described in individuals infected with other persistent pathogens, such as cytomegalovirus (CMV) or EBV [6, 29]. In a cohort of 161 non-symptomatic CMV seropositive individuals, as many as 11% were found to have CMV-specific CD4 T-cell frequencies above 10%. However, based on TCR-Vβ analyses, those cells were not of clonal origin . In contrast to these viral infections, median frequencies of PPD reactive T-cells among the 70 age-matched controls tested in our study were 100-fold lower and none of those had specific T-cell frequencies above 10% (fig. 1b). The existence of an immune response in which approximately one-third of all CD4 T-cells is devoted towards a single peptide raises concerns if the patient is able to mount a sufficient response towards other pathogens. However, the patient did not show any evidence for an increased susceptibility towards heterologous infections. An acute infection is also rather unlikely due to the considerable stability of the T-cell response over time. Of note, clonality of expanded T-cell populations is commonly considered as a diagnostic indicator for T-cell lymphoma or leukaemia . Our patient showed clonal TCR-γ rearrangements within whole blood cells (data not shown) consistent with some extent of premalignant T-cell expansion; however, even after 6 yrs of follow-up, there was no clinical evidence for any type of malignancy, as monoclonal T-cells were fully functional and were stably found over >2 yrs. Instead, this monoclonal expansion of T-cells may represent another example of a T-cell counterpart to a MGUS, which is a benign gammopathy, presumably arising from chronic stimulation of B-cells by self-antigens or microbial antigens over a lifetime . Such monoclonal T-cell expansions of undetermined significance (MTUS) have already been described before [32–34] and were particularly frequent in the elderly ; up to now, however, the antigenic specificities of those T-cells were not identified. In that respect, together with the absence of any definite M. tuberculosis-related morbidity, the monoclonal T-cell response directed against peptide E2 of ESAT-6 may represent the first MTUS where the antigenic specificity is known. We thank C. Guckelmus and R. Ruth (Department of Transplant and Infection Immunology, Saarland University, Homburg, Germany) for excellent technical assistance. We thank B. Thiele (Labor Dr. Thiele, Kaiserslautern, Germany) for HLA typing of the patient. Financial support was given by the Else Kro¨ner Fresenius Stiftung and HOMFOR to M. Sester (SE 1078/2-1, 2-2). S. Ehl is supported by BMBF grant 01 EO 0803.
. Enumeration of T cells specific for RD1-encoded antigens suggests a high prevalence of latent Mycobacterium tuberculosis infection in healthy urban Indians. J Infect Dis 2001; 183: 469–477.
. Differential T cell responses to Mycobacterium tuberculosis ESAT6 in tuberculosis patients and healthy donors. Eur J Immunol 1998; 28: 3949–3958.
. 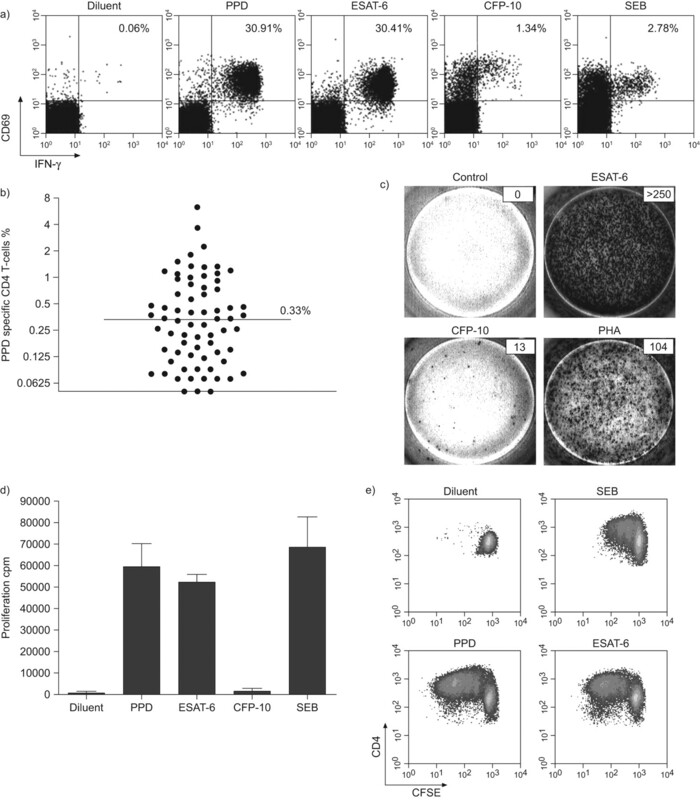 Sustained high frequencies of specific CD4 T cells restricted to a single persistent virus. J Virol 2002; 76: 3748–3755.
. PD-1 expression and IL-2 loss of cytomegalovirus-specific T cells correlates with viremia and reversible functional anergy. Am J Transplant 2008; 8: 1486–1497.
. The immunoscope approach for the analysis of T cell repertoires. In: Oksenberg JR , ed. The Antigen T Cell Receptor: Selected Protocols and Applications. Chapman and Hall, London, 1998; pp. 287–325.
. SYFPEITHI: database for MHC ligands and peptide motifs. Immunogenetics 1999; 50: 213–219.
. IMGT, the international ImMunoGeneTics information system. Nucleic Acids Res 2009; 37: D1006–D1012.
. Detection by flow cytometry of ESAT-6- and PPD-specific circulating CD4+ T lymphocytes as a diagnostic tool for tuberculosis. Int Arch Allergy Immunol 2007; 143: 1–9.
. Diagnosis of Mycobacterium tuberculosis infection using ESAT-6 and intracellular cytokine cytometry. Clin Exp Immunol 2005; 142: 132–139.
. Dominant TNF-alpha+ Mycobacterium tuberculosis-specific CD4+ T cell responses discriminate between latent infection and active disease. Nat Med 2011; 17: 372–376.
. Dynamic antigen-specific T-cell responses after point-source exposure to Mycobacterium tuberculosis. Am J Respir Crit Care Med 2006; 174: 831–839.
. Suspected transmission of tuberculosis in a maternity ward from a smear-positive nurse: preliminary results of clinical evaluations and testing of neonates potentially exposed, Rome, Italy, 1 January to 28 July 2011. Euro Surveill 2011; 16: pii19984.
. Cell-mediated immunity in anergic patients with pulmonary tuberculosis. Am Rev Respir Dis 1978; 118: 827–834.
. Circulating, Mycobacterium tuberculosis-specific lymphocytes from PPD skin test-negative patients with tuberculosis do not secrete interferon-gamma (IFN-gamma) and lack the cutaneous lymphocyte antigen skin-selective homing receptor. Clin Exp Immunol 2000; 119: 99–106.
. Immune responses in the skin in old age. Curr Opin Immunol 2011; 23: 525–531.
. Decreased TNF-alpha synthesis by macrophages restricts cutaneous immunosurveillance by memory CD4+ T cells during aging. J Exp Med 2009; 206: 1929–1940.
. Telomere erosion in memory T cells induced by telomerase inhibition at the site of antigenic challenge in vivo. J Exp Med 2004; 199: 1433–1443.
. Highly focused T cell responses in latent human pulmonary Mycobacterium tuberculosis infection. J Immunol 2005; 174: 2174–2184.
. Cross-reactivity between hepatitis C virus and influenza A virus determinant-specific cytotoxic T cells. J Virol 2001; 75: 11392–11400.
. Heterologous T cell immunity in severe hepatitis C virus infection. J Exp Med 2005; 201: 675–680.
. Cross-reactive influenza virus-specific CD8+ T cells contribute to lymphoproliferation in Epstein-Barr virus-associated infectious mononucleosis. J Clin Invest 2005; 115: 3602–3612.
. Heterologous immunity between viruses. Immunol Rev 2010; 235: 244–266.
. Implication of leucyl-tRNA synthetase 1 (LARS1) over-expression in growth and migration of lung cancer cells detected by siRNA targeted knock-down analysis. Exp Mol Med 2008; 40: 229–236.
. Aminoacyl-tRNA synthetases and tumorigenesis: more than housekeeping. Nat Rev Cancer 2011; 11: 708–718.
. Characterization of the CD4+ T cell response to Epstein-Barr virus during primary and persistent infection. J Exp Med 2003; 198: 903–911.
. A practical approach to the flow cytometric detection and diagnosis of T-cell lymphoproliferative disorders. Lab Hematol 2010; 16: 32–52.
. Monoclonal gammopathy of undetermined significance. Br J Haematol 2006; 134: 573–589.
. Clonal populations of T cells in normal elderly humans: the T cell equivalent to “benign monoclonal gammapathy”. J Exp Med 1994; 179: 609–618.
. A persistent T cell expansion in the peripheral blood of a normal adult male: a new clinical entity? Clin Exp Immunol 1992; 89: 279–284.
. Monoclonal T-cell dyscrasia of undetermined significance associated with recalcitrant erythroderma. Arch Dermatol 2005; 141: 361–367.